This throw embodies fully the judo principle of seriyoku-zenyo - the maximum efficient use of mind and body. When it is done properly the thrower exerts very little force at all. Success in this throw depends upon speed and timing. 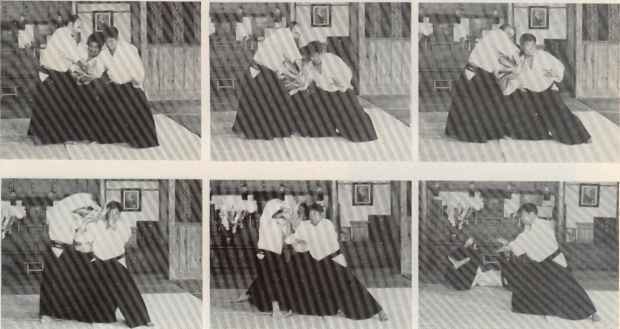 De-ashi-barai is attempted a lot by beginners with the result that the opponent's shins get very bruised. 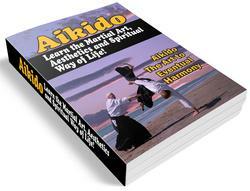 Like o-soto-gari it seems easy but is in fact quite difficult. Study the action shots of this throw. The opportunity for this throw occurs when your opponents steps forward. As he lifts his foot up and steps forward most of his weight is supported on the other foot but just at the time his front foot is an inch or so off the mat all his weight will be transferred to it and this is the moment for the throw. This throw can be likened to somebody stepping on a banana skin. Their foot comes down on to the skin and then slides away. Stand with your partner in right posture. With your right leg step backwards and then forwards and so on, get your partner to do the same with his left leg. This should be something like a natural walk except that only one leg moves in order to isolate the throwing movement. Your left leg and the opponent's right leg do not move. As the opponent's leg steps forward and is about an inch off the mat, using the flat of your right foot, sweep his foot across diagonally in front of your own left foot. If you have caught his foot at the right moment he will fall over. If you are a bit slow and his foot and weight are solidly on the mat it will seem like uprooting a tree trunk. If you are too soon in sweeping his foot it will just dangle in the air because his weight will still be on his rear foot. To finish off the throw the right arm pulls the man down to the mat. When this throw is done, with speed and correct timing the man may be levelled off almost at hip height. Using this one sided stepping movement as above, keep on trying to catch the right moment your partner steps forward. After a little bit of experimenting you will find the right occasions to avoid hurting your partner's ankles, take care to use the flat of your foot. The actual sweep with the right leg is not a hook or a push. The moment when the opponent's leg is in the right position is very short. Thus it is necessary to sweep across as fast as possible - using the weight and impetus of your leg rather than force and strength. In the beginning this will cause some bruised ankles but in the long run this is the style to aim for. This concludes the leg throw section. Three of them are rear throws and one is to the side. There are other leg throws some of which are forward throws and several variations of the ones already mentioned. As can be seen from the above throws there is almost no position the opponent can put his legs in without being vulnerable to attack. The beginner would do well to bear in mind all the opportunities for them and depending upon where your partner's weight is or how he is moving or reacting attempt to put them all in practice. One of the best ways for practising these or any other throw is to throw somebody with them as many times as the person can take, the faster and harder the better. Concentrate on speed rather than brute force. How to karate foot sweep properly?